Decking is synonymous with the great Aussie backyard. The first few months of 2019 will provide plenty of time to enjoy your beautiful patch of timber. But, with the new year comes new possibilities. Here are the decking trends you should consider for the upcoming year. Shade Cloth: This is the quickest and most cost-effective solution of covering your deck. It has the advantage of still allowing some sun through, while still providing protection from direct UV-rays and rain. Another advantage is that you can turn your deck into a cool little fernery. Create a Pergola or Patio: By adding a frame and some roofing, you can provide a more permanent solution. Trellises on the roof also have the added advantage of being perfect for running creepers. If you want to create the complete ‘outdoor living’ experience, you can even add some screening to the side of the decking. Front the screens with some lattice and run some creepers, or use modular fencing and create your own sanctuary with green walls. Modular fencing is cheap and durable, and all that extra plant-life will improve the air quality in your backyard. The year 2019 is all about filling every inch of your life with as many plants as possible. If you want to fill your deck with more greenery, choose planter boxes. You can add planter boxes to the borders of your decking as a design feature, and they have the added benefit of allowing you to change the look every year. If your decking isn’t in great condition, you may want to consider the use of composite decking. You don’t have to worry about maintenance or rot, and, you’ll be doing the environment a favour by saving all that beautiful hardwood from being logged. 2019 is also the year for the use of bold colours on your decking. Not bold in terms of yellow and purple, but deep chocolates, reds and even cappuccinos. Painting your deck is a great way to extend its lifespan, and, it’s the perfect DIY project. Head down to your local hardware store and find your ideal tint. If you don’t have a deck, now is the time to invest in one. You don’t even need a large backyard. Any outdoor space can be transformed into the perfect place to enjoy drinking, dining, reading, relaxing and everything in between, by the addition of a deck. Use a water feature to turn your deck into a real focal point. People love sitting around water features, and those little gurgles create the perfect sense of peace and relaxation. Water features come in various forms such as floating ponds or fountains that sit on top of your deck, or you can even place the water feature next to your deck in order to provide protection to your deck construction. Adding a fire pit is the perfect way to turn your deck into a 24-hour space. Fire pits come in various styles such as chimeneas, automatic gas versions, or you could even go down the do it yourself route. The DIY alternative involves finding an old washing machine drum, polishing it and, voila, you’ve got a free fire drum. Modern lighting systems offer a sleek design option for your deck. Again, lighting makes your deck a 24-hour space and adds important ambience and safety. It can be installed along rails, on stairs and even on posts. Lighting is an easy and relatively inexpensive way to revolutionise your deck. Depending on the strength of your deck foundations, it could be turned into an outdoor kitchen. With the addition of a great barbecue and an outdoor preparation and cleaning area, all of the cooking can be undertaken outside. Add a fridge, and you don’t even have to go inside for a drink. If the new year has you in the mood for a new deck or the upgrade of an existing deck, use these ideas as an inspiration. 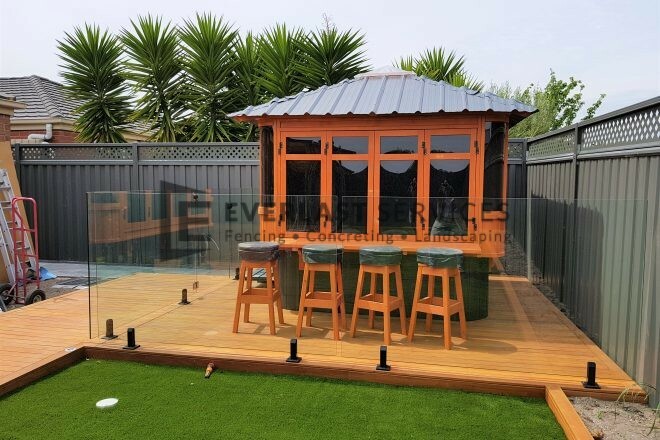 If you need the perfect contractor to make these ideas come to life, get in touch with the experts at Everlast Services.